Western red cedar should be avoided unless it is certified by an organization accredited by the Forest Stewardship Council (FSC) and old growth western red cedar should be avoided entirely. Western red cedar (WRC, also called giant arborvitae ("tree of life") ranges from northern California to Alaska among the coastal temperate rainforests of North America. It is associated with Douglas fir and western hemlock in most places where it grows. A massive tree reaching heights of up to 60 meters (180 feet) and diameters typically of 3 meters (9 feet) and occassionally as wide as 6 meters (18 feet). The Quinault Lake Cedar is the largest known Western Red cedar in the world with a wood volume of 500 cubic meters. Located near the northwest shore of Lake Quinault north of Aberdeen, Washington, about 34 km from the Pacific Ocean, it is 53.0 m high with a diameter of 5.94 m (Van Pelt, 2001). In addition to growing in lush forests, western red cedar is also a riparian tree, and grows in many forested swamps and streambanks in its range. The tree is shade-tolerant, and able to reproduce under dense shade. 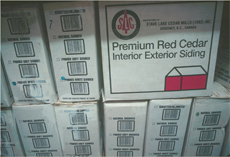 Western red cedar's soft red-brown wood is used extensively in outdoor construction such as porches, posts and railings; decking; fencing; outdoor furniture; indoor and outdoor siding, window frames, paneling and shingles; lining of closets and clothing chests (it's cedar-like aroma is thought to discourage moths); saunas; hot tubs, etc. British Columbia, Canada in 1995. Western red cedar timber has been used extensively by native people of the northwest coast of North America, from Oregon to southeast Alaska. Its wood is used to make canoes, totem poles, houses, masks, helmets, armor, boxes, utensils, tools, and many other art and utility objects. The bark of Western red cedar, which is removed easily in long strips, was also used extensively for making baskets, rope, clothing and other items. Some northwest coast tribes refer to themselves as "people of the redcedar" because of their extensive dependence on the tree for basic materials. border, cranking out cedar shakes. the tree to have been over 1,000 years old. Weyerhaeuser now markets WRC under the label CedarOne. They actually refer to this product as "Environmentally Friendly", yet the forests are being rapidly clearcut and logged out of old growth cedar. being sold in The Home Depot in 1997. For alternatives to Western red cedar for outdoor furniture, see our Outdoor Furniture page in the What to Avoid/What to Choose section. For alternatives to Western red cedar for decking, see our Decking page in the What to Avoid/What to Choose section. For alternatives to Western red cedar for siding, see our Siding page in What to Avoid/What to Choose section.